I've seen some reports beginning to pile up around the net about NPCs staying indoors all the time even when no dragon attacks are taking place. A few of these posts have determined that something in Wet & Cold is getting in the way now. The users disabled the function in Wet & Cold to send people indoors during bad weather, but this did not fix the issue. Completely uninstalling that mod *DID* fix the issue, but for obvious reasons one should not do this on a save they intend to keep playing with. If you are running into this, give that a try JUST FOR TESTING. Do not continue with the game even if it fixes the problem because yanking a script heavy mod out of the game like that is a bad idea. You're only looking to see if this corrects the problem. If it DOES, that's probably something that will need to be brought up with Isoku so he can figure out what's going on there. If you ARE NOT using Wet & Cold and are having this problem, look at the sticky below this one and follow those instructions to report the problem. Failure to follow the process means I CANNOT HELP YOU. In order to debug any problems that may occur with the mod, some information is REQUIRED - without it, there's nothing I can do. Comments reporting problems with the mod will be ignored unless this information is supplied. In order to make this slightly easier to gather, I've updated the package with a global debug toggle that will turn on the log messages on demand. Open the menu for the mod, select options, enable the "Script Debugging" option, and then close the menu. This menu will also tell you if the quest is running too. 1. A copy of "C:/Users/<USERNAME>/Documents/My Games/Skyrim/Logs/Script/Papyrus.0.log"
2. A copy of "C:/Users/<USERNAME>/Documents/My Games/Skyrim/Logs/Script/Script/AliasDump/AliasDump.0.log"
Archive these files and put them on something like DropBox, or paste the contents to Pastebin.com, then provide a link to where I can get these. One thing - don't bother if you're one of those people who has altered your Papyrus memory settings. Any logs I see in which this has taken place will be dismissed. Altering those settings is bad for the game and leads to malfunctions in scripting that can cause all sorts of unwanted behavior. If you're not using default vanilla Papyrus memory settings, I don't want to hear from you. Posts advising people to deactivate or uninstall the mod to fix problems will be summarily deleted. People should know by now this is not a good idea for Skyrim and I will not allow such advice to remain posted. Beginning January 1, 2018 this mod on Skyrim Legendary Edition will no longer be supported. In my opinion, SSE has come into its own, and even though right now SKSE64 and SkyUI are both considered alpha versions, I don't see that status lasting much into next year. Maintaining support for a crippled and aging platform at this point no longer makes any sense. So when the new year comes, the comments will be locked and the mod will no longer be receiving updates of any kind. No permission will be granted to make updates, and no, I will not turn the mod over to the Care Taker account either. All work in 2018 will happen only on the SSE branch. Heya, I've been using your mod since 2015, with When Vampire Attacks and Run For Your Life. Question is, since I use old version of the mod (BOTH) and now WVA are incorporated into RFYL, how should I update the mod? Do I simply enable the new version (and disable old ones on the modlist) or else? Thanks in advance. EDIT : nvm found it the hard way; need to make new save game. Disabling and deleting won't work and NPCs are suddenly stay indoors forever. Actually, no, a new game is not required. Installing this over the top of what you have and then removing WVA from the game will work just fine. NPCs will not remain stuck, and I've personally verified this by deliberately performing the upgrade in the middle of a vampire attack. The only downside was that the NPCs came out of their homes and were killed by the vampires, but I would hope people have enough sense not to upgrade the mod in the middle of an attack anyway. If the mod support ends at the 1st of Jan. Does this mean you are gonna release the final update at the 31st? Kind of wondering if it will get any updates before the end of year. It's unlikely there will need to be any further updates for this. It works and the integration went smoothly and hasn't caused any problems. Hey, I've recently noticed that a number of my mods need to be updated, and as I update infrequently, I'm not sure/since forgotten some of the specifics and terminology; what does that warning in the installation section mean? I usually just download it from the nexus site onto the nexus manager, disable and delete the previous version, then install and enable the current one. Is that how I should do it for this mod and other mods with a similar warning? It means you're doing it right, as long as you do a LOOT-and-Bash* then start a new game after you're done updating your mods. In the mod options it says 'Quest status: stopped' on both vampires and dragons. Whats up with that? Is that connected to actual vampire/dragon quests? It means no events are active, so that's normal to see. Meanwhile, I continue to play with only "Run For Your Lives" 2.1.1a and without "When Vampires Attack". Why? Because I use "Protect Your People" to keep my Unique NPCs from untimely deaths, but I'm also using "Populated Skyrim - HELL Edition" to add 'furniture' NPCs to the game. Now, while everybody has (or should have) the good sense to run for cover when there's a dragon about, I also enjoy seeing some carnage on the streets when a rogue Master Vampire decides to rampage in one of the cities. A few dead beggars, servants, laborers etc. makes for some realism. Love your work, don't get me wrong, but there *are* still some of use who prefer having the separate effects of RFYL and WVA. Would you be able to add the file for just "Run for your lives"? I don't have Dawn Guard, and I'm sure many other people don't as well. No, most people do have Dawnguard by now. This has been a popular request for some time, so I figured I'd get it done. As you may notice I've aggressively removed downloads for When Vampires Attack since the content is now entirely within this mod. Please remove WVA if you have it installed before updating to this release or you'll end up with some truly nasty surprises that can't be fixed. Wouldn't be nice to merge 'run for your lives ' with 'when vampire attacks '? I think everyone interested in this game should possess the full version nowadays - after legendary we got the Special edition and soon the Vr edition, they all have all dlc's pre-installed. So we save another slot in our load order. Both mods complement each other. Before I had this mod I arrived in Riverwood, a dragon attacked and both Alvor and Sigrid were killed. Their daughter came up to me and said "My parents are dead...what do I do now?". I was devastated. So I loaded the mod and reran the attack. Alvor and Sigrid went indoors and were safe but good ol' Faendal got kllled instead. Oh well, he's no longer any use to me so I'll just leave his body in the street for everyone else to ignore. Heh, poor Faendal. Always being picked on. Thnk you for mod! I would like to test how this working in my game. 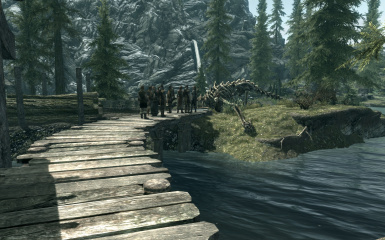 Will spawning console dragons allow NPCs tp run inside and trigger this mod? 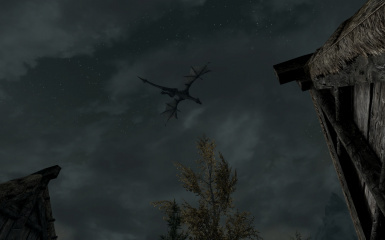 Spawning mod dragons or only Vanilla? You can do that, yes, but it's generally better to manipulate the global variable in the article that's linked. Then fast travel to somewhere you know can be attacked, like Riverwood. This will make sure the event fires properly. 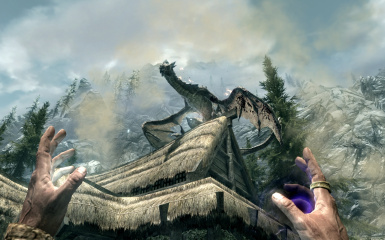 Hand spawning dragons works fine but it's not a complete test.